Without the bike today we had time to explore Aswan, here with the Nile in the background. 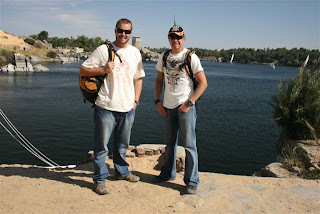 Aswan is very tourist friendly, with allot to do and see. At last we had some beer!! jul lyk soos twee wafferse toeriste. Tyd om die jeans weg te gooi steve. Lyk goed!!! !